This mod adds a hand powered grindstone, a horsepowered grindstone, a manual chopping block, a horsepowered chopping block and a horsepowered press. It is highly customizable to work well with mod packs. You can add recipes to the grindstones, the chopping blocks and the press through the config or CraftTweaker. The commands and syntax for CraftTweaker can be found on the wiki on Github. 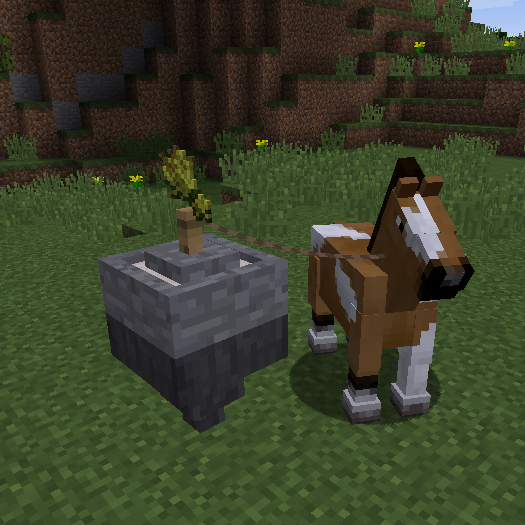 You can add custom mobs to power the horse powered blocks in the config. You can add recipes with the in-game config editor. Hello! This mod is very interesting! I want to repost this mod to MCBBS(www.mcbbs.net), the biggest minecraft forum in China.I will link to Curse.Do you agree? Can you update mod to 1.10.2 please? How I can change the recipe of manual chopping blocks? Anyone one know of any suitable old-timey pipe mod to get fluids out of the press? I believe the Ceramics mod has porcelain channels that can be used as fluid pipes. Can you add a manual press? Thanks, very good mod for modpacks. PS: this mod is awesome! You can't add multiple items as the input. Looks like you are trying to combine two items, and that's not possible with this system. In the game config for add axes in a chopping block i have to put the Id(4023)or the craftweaker id (flinttools:ftaxe) ?? Needs more info in the wiki about what the blocks do. So I'm making a combat modpack called "prepare for dawn", and I am using your impressive mod for an early-game alternative for rf-powered machinery. I want to be able to use the handheld grindstone (and the normal one) to be able to grind down iron ore into dirty iron dust from mekanism. Unfortunately, I can't figure out how to use the craftweaker configurations. I have everything copied down (seemingly) correctly, yet I can't figure out what is wrong. Could you please tell me what I've done wrong? Thanks. Also, one thing you could do to un-confuse us noobs is add examples to your wiki page on how to do stuff. It'd really have been useful. The <> parts are mostly to show that it's a parameter, the only ones requiring it are the items. The number and boolean can't have it and it won't work with them. Did your mod have support for Animania custom mobs? Thanks in advance!